One Day National Seminar on Governance of Emperor Samrat Ashok Period in Present Context was organized by Dept. 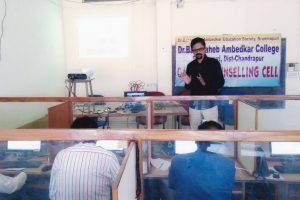 of Pali on14th March 2014.The Seminar was inaugurated by Dr. Dhammarashmi, Secretary, Indo-Thai Buddhist Association, Sarnath, Varanasi, Mr. Marotrao Kamble, vice- president of the Dr. Babasaheb Ambedkar Education Society, Bramhapuri , Prof. Devesh Kamble, Secretary, Dr. Babasaheb Ambedkar Education Society, Bramhapuri, Dr. Balchandra Khandekar,Chairman, BOS(Pali) RTM Nagpur University, Nagpur, Dr. Niraj Bodhi, Head , Dept of Pali, RTM Nagpur University and Dr. Azizul Haque, Principal of the College. After the inauguration the key note address was delivered by Dr. Niraj Bodhi, Head , Dept of Pali, RTM Nagpur University in which he talked about Governance of Emperor Samrat Ashok Period in detail. The first session was delivered by Dr. Malati Sakhare, Head, Surajit Kumar Sing, Head, Dept. of Pali, Mahatma Gandhi Antarratriya Hindi Vishwavidyalay, Wardha, Dr. Priyadarshi Khobragade, Dept. of History , RTM Nagpur University, Nagpur and Dr. Sanjay Tambagade, Dept. of Pali, Pune University under the chairmanship of Dr. Sushila Muljadhav, former Head, Dept. of Pali, Dr. Ambedkar College, Aurangabad. The Second session was delivered by Dr. Malati Sakhare, Head, Dept. 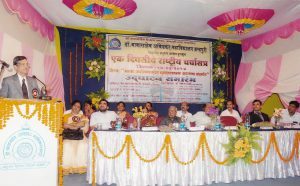 of Pali, RTM Nagpur University Under the chairmanship of Dr. Balchandra Khandekar,Chairman, BOS(Pali) RTM Nagpur University. The Chief Guests Validictory session were Prof. Devesh Kamble, Secretary, Dr. Babasaheb Ambedkar Education Society, Bramhapuri and Prof. Snigdha Sadafale, Head, Dept. of Pali, Dr. Ambedkar College, Chandrapur. The Vote of thanks proposed by Prof. B. M. Dange, Head, Dept. of Pali of the College for all the sessions. 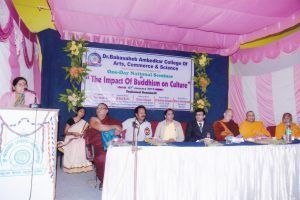 One Day National Seminar on Impact of Buddhism on Indian Society was organized by Buddhist Studies Center of the College on 7th Jan. 2015.The Seminar was inaugurated by Dr. Angaraj Chaudhari, Editor, Vipasana Research institute Dhammagiri Igatpuri, Nasik, Bhante Vinaikirti Gunaseri, Nagpur, Prof. Dr. Ramnandan Singh, Dept. of Buddhist Studies, University of Jammu, Mr. Marotrao Kamble, vice- president of the Dr. Babasaheb Ambedkar Education Society, Bramhapuri , Prof. Devesh Kamble, Secretary, Dr.Babasaheb Ambedkar Education Society, Bramhapuri, Dr. Balchandra Khandekar,Chairman, BOS(Pali) RTM Nagpur University, Nagpur and Dr. Azizul Haque, Principal of the College. The Chief Guests Validictory session were Prof. Devesh Kamble, Secretary, Dr. Babasaheb Ambedkar Education Society, Bramhapuri and Dr. Azizul Haque, Principal of the college. The Vote of thanks proposed by Prof. B. M. Dange, Head Dept. of Pali, of the College for all the sessions. One Day National Seminar on Dr. Ambedkar’s Contribution to Agricultural Development. One Day National Seminar on Dr. Ambedkar’s Contribution to Agricultural Development was organized by Dr. Ambedkar Studies Center on 10th Jan. 2015.The Seminar was inaugurated by Dr. Pradeep Aglawe, Head Dr. Ambedkar Chair R.T.M. Nagpur University Nagpur. Mr. Marotrao Kamble, vice- president of the Dr. Babasaheb Ambedkar Education Society, Bramhapuri, Dr. Suresh Waghmare Head Dept of Sociology, Shahu College Latur, Dr. Jagan Karade Head Dept of Sociology Shivaji University Kolhapur Prof. Devesh Kamble, Secretary, Dr. Babasaheb Ambedkar Education Society, Bramhapuri, Dr. Azizul Haque, Principal of the College. After the inauguration the key note address was delivered by , Dr. Pradeep Aglawe, which he talked about Dr. Ambedkar’s Contribution to Agricultural Development in detail. The Second session was delivered by Dr. Saroj Aglawe Dept of Sociology Mahila Mahavidyalaya Nagpur Dr. Parish Bhagat Head Dept of Economics Hislop College Nagpur, Dr. Saroj Dange Dept of Ambedkar Thought North Maharashtra University Jalgaon. Under the chairmanship of Dr.Jagan Karade Head of Dept Sociology Shivaji University Kolhapur. The Chief Guests Validictory session were Prof. Devesh Kamble, Secretary,Dr. Babasaheb Ambedkar Education Society, Bramhapuri and Dr. Azizul Haque, Pricipal of the college. The Vote of thanks proposed by Prof. R. M. Meshram, Co-ordinator of the center for all the sessions. One day university level workshop on IPR: Copy Right’ was organized by IQAC on 26th Aug. 2016 in Seminar Hall. The workshop was inaugurated by Dr. Azizul Haque, Principal of the College, Shri. Nazim Sheikh, Librarian, Mohasinbhai Zaveri College Desaiganj (Wadsa) Dist- Gadchiroli, Prof. Shri. D.B.Fulzele, IQAC,Co-ordinator of the college and Shri. U.G.Harde, the Co-ordinator,of the workshop. After the inauguration the key note address was delivered by Shri. Nazim Sheikh, Librarian, Mohasinbhai Zaveri College Desaiganj (Wadsa) in which he talked about Copy Right in detail. The second session was delivered by Prof. D. B. Fulzele, Dept. of English of the college in which he explained the significance of Copy Right and ethics of research as well. Shri. U.G. Harde, the Co- ordinator of the workshop proposed vote of thanks for all the sessions. One Day University level workshop on Goods and Service Tax (GST)One Day University level workshop on ‘Goods and Service Tax (GST)’ was organized by Dept. of Commerce on 10th March 2017 in Seminar Hall. 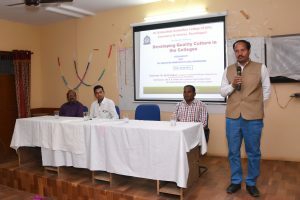 The workshop was inaugurated by Prof. Devesh M. Kamble, Secretary of the Dr. Babasaheb Ambedkar Education society (Chanda), Dr. Azizul Haque, Principal of the College, Prof. T. Y. Gaydhane, Dept. of Commerce G.W. College Nagbhid, Dr. Rekha Meshram, N.H. College ,Bramhapuri , Prof. S. R. Padole Dept. of Commerce of the College, Prof. Y .P . Ramteke, Co-ordinator of the workshop and Prof. I. U. Sheikh, Organizing Secretary of the workshop. After the inauguration the key note address was delivered by Prof. T. Y. Gaydhane, Dept. of Commerce, G.W. College Nagbhid in which he talked about a Goods and Service Tax in detail. The second session was given by Dr. Rekha Meshram, N.H. College Bramhapuri in which she talked about advantages and disadvantages of the GST. The Third session was delivered by Prof. S. R. Padole. He explained the consequences of the GST. Prof. I. U. Sheikh, Organizing Secretary of the workshop proposed vote of thanks for all the sessions. One Day University Interdisciplinary Seminar on Mahatma Fule as Pioneer of Social Reforms was organized by IQAC on 11th February.2017. The Seminar was inaugurated by Prof. Devesh Kamble, Secretary, Dr. Babasaheb Ambedkar Education Society, Bramhapuri. Dr. Azizul Haque, Principal of the College, Dr. D.T. Gajbhiye, Principal Aniket Mahavidyalaya Desaiganj (Wadsa) Dist- Gadchiroli. Prof. Nihar Bodele, Head Dept. of Economics, Adarsh Arts and Commerce College Wadsa. Prof. Warsha Chandanshive, Dept. of Political Science,N.H. College Bramhapuri. Prof. L.H. Nandeshwar , Coordinator of the workshop, Dr. R.P. Kamble Organizing Secretary of the Seminar . After the inauguration the key note address was delivered by , Dr. D.T. Gajbhiye, Principal Aniket Mahavidyalaya Desaiganj (Wadsa) Dist- Gadchiroli in which he talked about various aspects of Mahatma Fule’s life as a champion of Social Reforms. The second session was delivered by Prof. Nihar Bodele, Head Dept. of Economics, Adarsh Arts and Commerce College Wadsa in which he explained educational thoughts of Fule. The third session was delivered by Prof. Warsha Chandanshive, Dept. of Political Science,N.H. College Bramhapuri in which she talked about the role of Mahamta Fule for women’s emancipation. Prof. Prof. L.H. Nandeshwar the Co- ordinator of the Seminar proposed vote of thanks for all the sessions. 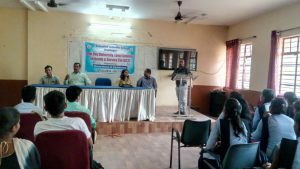 One day Workshop on ICT Based Teaching- Learning was organized by Career Counseling Cell on 24th Mar. 2017. The workshop was inaugurated by the chief guests such as Prof. Devesh M. Kamble, Secretary of the Dr. Babasaheb Ambedkar Education society (Chanda), Dr. Azizul Haque, Principal of the College, Prof. Akash Meshram, N. H. College, Bramhapuri. Shri. U.G.Harde, librarian of the College, Dr. Rupesh Meshram, Co-ordinator of the workshop. 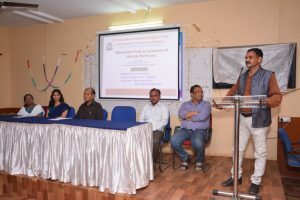 After the inauguration the key note address was delivered by Prof. Akash Meshram, N. H. College, Bramhapuri in which he talked about ICT Based Teaching- Learning in detail especially Learning Management System (LMS). The second session was delivered by Prof. U.G.Harde in which he explained the Student-centric Methods of Teaching-Learning and how to use e-resources to enrich teaching-learning process. Dr. Rupesh Meshram, the Co- ordinator of the workshop proposed vote of thanks for all the sessions. 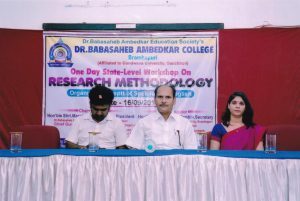 One Day State level workshop on ‘Research Methodology’ was jointly organized by Dept. of English and Dept. of Sociology on 16/09/2017 in Seminar Hall. The workshop was inaugurated by Prof. Devesh . M. Kamble, Secretary of the Dr. Babasaheb Ambedkar Education Society (Chanda), Dr. Azizul Haque , Principal of the College, Dr. Santhosh Buradkar, Dept. of History Gondwana University Gadchiroli , Dr. P. D. Nimsarkar, Principal Vanashri Mahavidyalaya, Korchi Dist- Gadchiroli, Prof. Shri. D. B. Fulzele, IQAC Co-ordinator of the college and Prof. Snigdha R. Kamble the Co- ordinator of the workshop. After the inauguration the key note address was delivered by Dr. Santosh Buradkar, Dept. 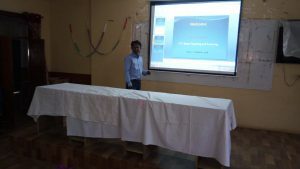 of History Gondwana University Gadchiroli in which he talked about various aspects of Social Science research. The second session was given by Dr. P. D. Nimsarkar, Principal Vanashri Mahavidyalaya, Korchi Dist- Gadchiroli. He talked about the various aspects of literary research. The third session was delivered by Prof. D. B. Fulzele, Dept. of English of the college. He explained the importance of computer in research. Prof. Snigdha R. Kamble the Co- ordinator of the workshop proposed vote of thanks for all the sessions. 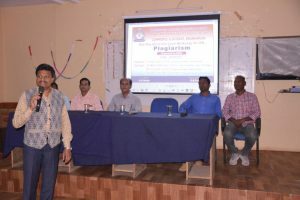 One day university level workshop on ‘IPR Plagiarism’ was organized by IQAC on 28th Sept. 2017 in Seminar Hall. The workshop was inaugurated by Prof. Devesh . M. Kamble, Secretary of the Dr. Babasaheb Ambedkar Education society (Chanda) , Dr. Azizul Haque , Principal of the College ,Shri. Mohan Ratkantiwar, Librarian, Y.P. College Talodhi ( Balapur ), Prof. Sanjay Chavhan, Dept. of Society by, Y.P. College, Talodhi ( Balapur ), Prof. Shri. D. B. Fulzele, IQAC co-ordinator of the college and Shri. U.G. Harde, the Co-ordinator of the workshop. After the inauguration the key note address was delivered by Shri. Mohan Ratkantiwar in which he talked about IPR: plagiarism in detail. The second session was given by Prof. Sanjay Chavhan, Dept. of Sociology, Y.P. College, Talodhi (Balapur). He talked about the ethics of Research. The third session was delivered by Prof. D. B. Fulzele, Dept. of English of the college. He explained the significance of IPR. Shri. U.G. Harde, the Co-radiator of the workshop proposed vote of thanks for all the sessions. One day Workshop on Teaching- Learning and Evaluation was organized by IQAC on 11th Jan. 2018. The workshop was inaugurated by chief guests such as Dr. Azizul Haque, Principal of the College, Dr.M.K.Rahangdale Principal, Nagarjuna College of Engineering & Technology, Nagpur. 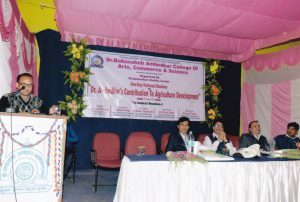 Prof. H.B.Dhote, Adarsh College of Arts & Commerce College, Wadsa, Prof. Dr. Y.P.Sonkusare, Arts and Commerce College, Bhisi. Prof. R.M.Kose, Co-ordinator and Prof. D.B.Fulzele, organizing Secretary of the workshop. After the inauguration the key note address was delivered by Dr.M.K.Rahangdale Principal, Nagarjuna College of Engineering & Technology, Nagpur in which he talked about Teaching- Learning and Evaluation in detail. The second session was delivered by Prof. H.B.Dhote, Adarsh College of Arts & Science College, Wadsa in which he explained the Method of Evaluation. The Third session was delivered by Prof. Dr. Y.P.Sonkusare, Arts&Commerce College, Bhisi in which he explained the Student-Centric Method of Teaching-Learning. Prof. R.M.Kose, the Co- ordinator of the workshop proposed vote of thanks for all the sessions. One day Workshop on ICT Based Teaching- Learning was organized by Career Counseling Cell on 20th Mar. 2018. The workshop was inaugurated by the chief guests such as Prof. Devesh M. Kamble, Secretary of the Dr. Babasaheb Ambedkar Education society (Chanda), Dr. Azizul Haque, Principal of the College, Shri.Manoj P.Borkute ,Techno-Tronics Communication, Bramhapuri. Shri. U.G.Harde, librarian of the College. Dr. Rupesh Meshram,Co-ordinator of the workshop. After the inauguration the key note address was delivered by Shri.Manoj P.Borkute ,Techno-Tronics Communication, Bramhapuri in which he talked about ICT Based Teaching- Learning in detail. The second session was delivered by Prof. U.G.Harde in which he explained the Method of Teaching-Learning and how to use e-resources to enrich teaching-learning process . One day Workshop on Developing Quality Culture in the Colleges was organized by IQAC on 05th August.2015. The workshop was inaugurated by the chief guests such as Dr. Azizul Haque, Principal of the College, Dr. H.B.Dhote, IQAC Co-ordinator, Adarsh Arts & Commerce College Wadsa. Dr. Nikita Mishra,IQAC Co-ordinator, G.W.College Nagbhid Prof. D.B. Fulzele, Co-ordinator of the workshop, Prof. R.M.Kose, organizing Secretary of the workshop . After the inauguration the key note address was delivered by Dr. H.B.Dhote, IQAC Co-ordinator, Adarsh Arts & Commerce College Wadsa in which he talked about ICT Based Teaching- Learning in detail. The second session was delivered by Prof. Hiralal Bansod, , IQAC Co-ordinator, Y.P..College Talodhi in which he explained various e-resources, tools and materials for enriching teaching-learning process. Prof. D.B. Fulzele, the Co- ordinator of the workshop proposed vote of thanks for all the sessions.